Made to the SIZE YOU NEED! Get the exact size cutting board that you need. We manufacture our cutting boards to the exact size you need. This Cutting Board is made of Super High Density Polyethylene Plastic. The cutting boards are Commercial Dishwasher Safe, including the spike temp that exceeds 185°. They are the most dense board you can buy that will not dull your knives. They are USDA, FDA, NSF listed and approved by the Canada Dept. of Agriculture. Food saftey is important! 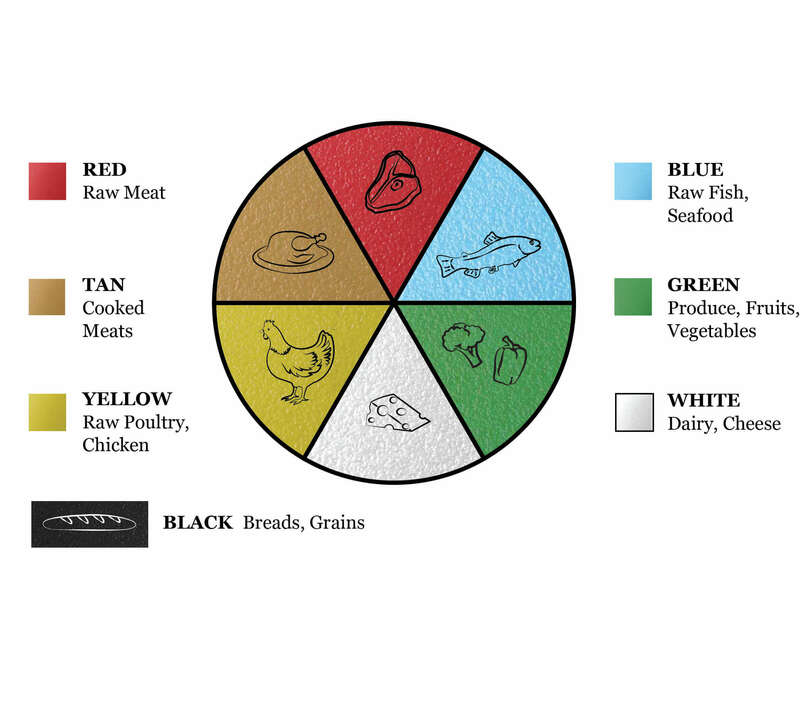 Using color coded cutting boards reduces the chance of cross-contamination when preparing food. Our cutting boards are NSF Certified and HCAAP compliant. Need something other than a square or rectangle board? NO PROBLEM! We can make boards of any shape or size, circle, cut outs, etc. We use a powerful CNC machine to cut the board to your exact specifications. If you can dream it, we can make it! We can also engrave names, logos, etc. Pricing varies depending on the project. We do not have a minimum order quantity! This was exactly what I was looking for. Extremely fast. I ordered on the 24th and the product was delivered on the 27th. It was made to the exact dimensions I needed. This was for an outside kitchen and exceeded my expectations. Will use cutting board company for all my future needs. I will also recommend your company to everyone that has cutting board needs. Thank you for the fast delivery. I have previously ordered a cutting board and this is a 2nd order. Both were cut to my exact specifications and fit the openings perfectly. Very timely arrival also. Our cutting board arrived in a timely manner. It was a perfect fit to go over our sink providing me with more counter space. This company is really great! I ordered many small, custom size cutting boards. A bit more work for Cutting Board Co. to make but the price did not increase. The boards were shipped the same day, and were exactly what I ordered. The quality is perfect and I couldn't be happier. Bravo! My fiancé (who likes to cook) suggested that I get a larger cutting board so I started looking online and every website I’ve visited frustrated me because dimensionally their boards were too large or small, were made overseas or you had to buy minimum quantities! I especially like the Cutting Board Company because I could talk to a knowledgeable representative, order the exact size/edge profile I needed with no minimum quantities and most importantly my fiancé used and loved it! Kitchen remodel, ordered an updated replacement for old under counter pull out cutting board. Fast service, perfect fit, modern sanitary replacement for old wooden cutting board. Arrived on time as promised and was exactly what we needed. Thanks again so much for getting it here on time.